I used to hate lentils. Not lentils swimming around in soups and stews but lentils in a pile on a plate? No thanks. I think that’s because I’d never had really great lentils. They were always an afterthought, sometimes not cooked all that well, and boring. So imagine my surprise that I not only enjoyed these lentils (and the accompanying salmon), but I LOVED THEM. When Jim tasted this dish the other night he pronounced it to be “restaurant quality”. What’s even better is that it is pretty quick and EASY! 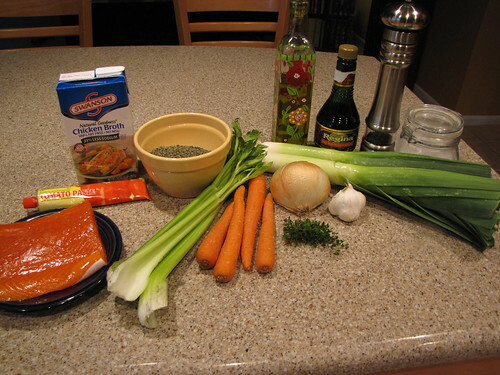 Salmon, Green “French” Lentils, Onion, Leeks, Celery, Carrots, Garlic, Thyme, Chicken Broth, Tomato Paste, Red Wine Vinegar, Olive Oil, Salt & Pepper. The method for cooking these lentils requires a quick 15 minute soak. Bring 3 cups of water to boil in a medium sauce pan. 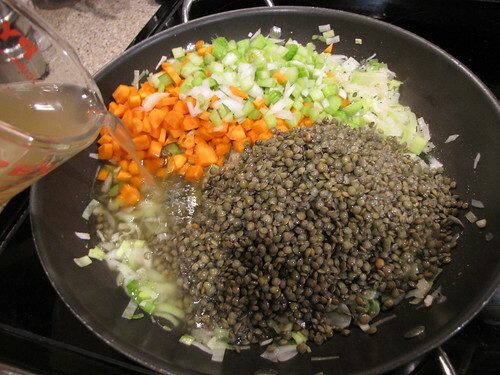 Rinse and pick over 1 1/8 cup of small green French lentils to remove any foreign bits. 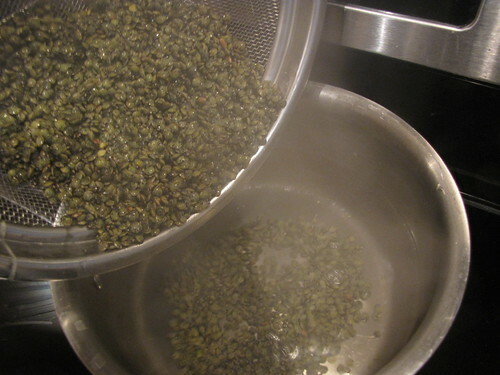 When the water comes to a boil, remove the pot from the heat, add the lentils, cover, and let them soak for 15 minutes. Meanwhile, there are veggies to chop. Remove the roots and tough green ends from two leeks leaving only the white and light green parts. 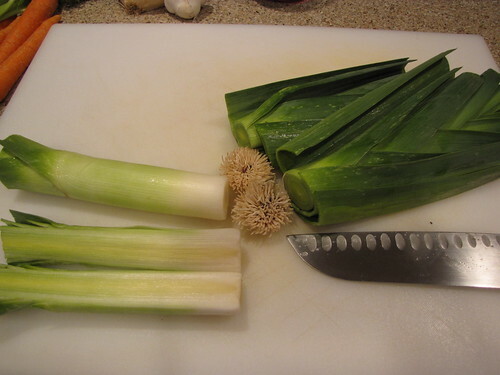 Cut the leeks in half and rinse them thoroughly under running water to remove any dirt and sand. Once clean, pat them dry and finely chop the leeks. Finely chop one large onion so you have about 2 cups. 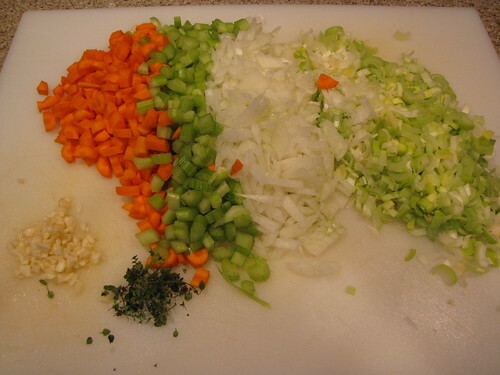 Peel and finely chop 4-6 carrots and 4 ribs of celery so you have about 1 1/2 cups each. Peel and mince 3 cloves of garlic and remove the leaves from several sprigs of fresh thyme, about 1 teaspoon. After 15 minutes, drain the lentils and discard the soaking water. Heat 2-3 Tablespoons of olive oil over medium high heat in a very large pan. I used only 2 Tablespoons of oil because I have a non-stick pan. 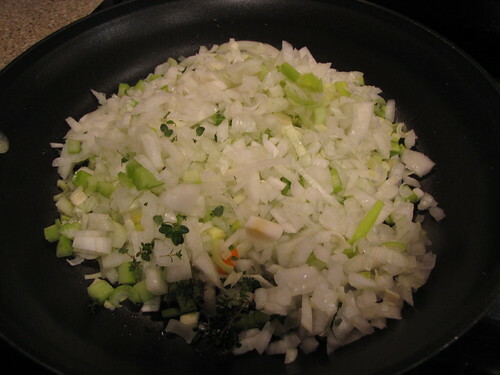 Add the onions, leeks, and thyme leaves and season with 1 teaspoon each of salt & pepper. Sauté the vegetables for about 5 minutes until they start to soften and become translucent but not browned. 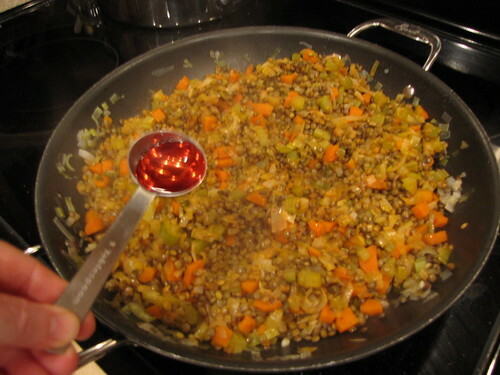 Add the carrots, celery, garlic, and drained lentils to the pan. Stir in 1 1/2 cups chicken broth and 2 Tablespoons of tomato paste. Bring the lentils to a boil, cover with a lid, reduce the heat to low, and simmer for 20 minutes or until the lentils and vegetables are tender and no longer crunchy. NOTE: The salmon cooks VERY quickly so be sure your lentils have cooked before you start the salmon. The lentils can be held over very low heat or even served at room temperature. Better to hold the lentils than over cook the salmon. For each person, you will want a fillet of salmon between 6-8 ounces. Drizzle a little olive oil over the fish and rub to coat both sides. 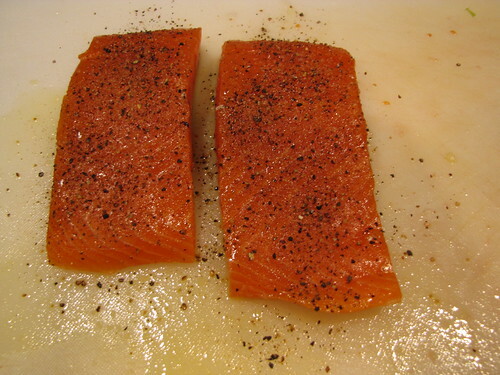 Sprinkle the top of each fillet with a little salt and lots of freshly cracked black pepper. Heat a heavy, oven proof pan like a cast iron skillet on top of the stove over a high burner for 3-4 minutes. 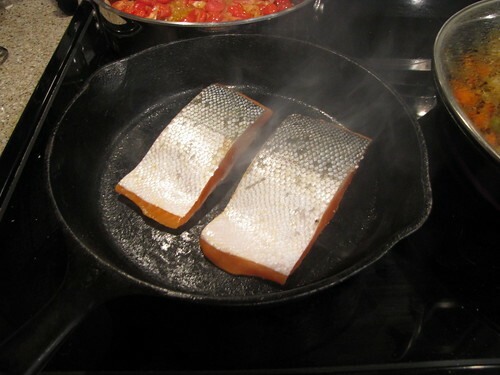 When the pan is extremely hot, add the salmon skin side UP and sear for 1-2 minutes. Flip the fish over and marvel at the lovely crust that has formed from the hot, dry pan. Immediately transfer the pan to a 450 degree oven and finish cooking the fish 5-7 minutes more. 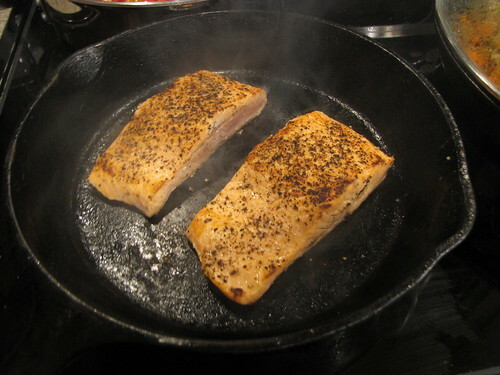 Depending on the thickness of your fish, the salmon needs NO MORE than 5-7 minutes TOTAL cooking time. When in doubt, undercook the fish and pull it out of the oven to rest like you would a steak. It will continue to cook from the hot pan and residual heat. The fish will be have a golden crust on the top and should flake easily with a fork. 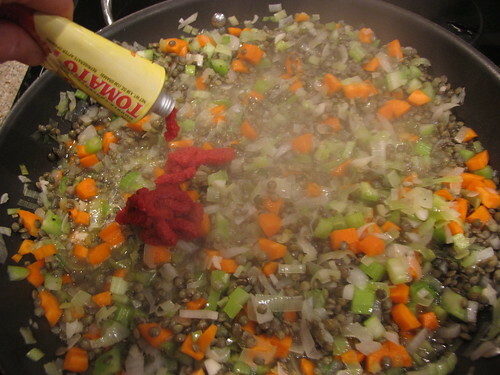 When you are ready to serve, remove the lentils from the heat and stir in 2 Tablespoons of red wine vinegar. 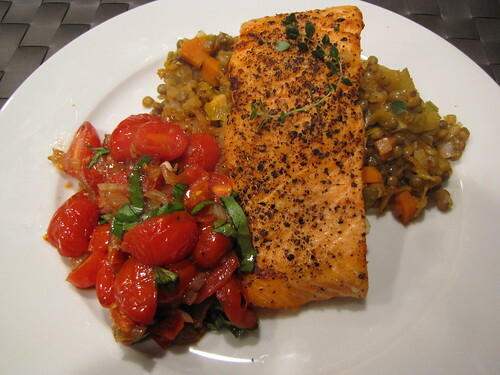 Serve each salmon fillet on a bed of the savory lentils and vegetables. Add something fresh like a green vegetable, small salad, or these saucy balsamic tomatoes (recipe coming soon). This recipe makes enough lentils for 4 servings. If you are not serving 4 people, you can easily cut the recipe in half. However, they are extremely good leftover served either hot or cold so I would encourage you to make the full recipe. Yum! And if you have any salmon leftover…Ina’s Salmon Cakes are fabulous!